The USB dongle supplied with the speakers can be used with mobile phones or tablets so long as an adapter is used, a micro USB example is supplied in the box for Android devices but Apple users will need to shell out for a USB camera kit to hook up their iOS devices. Pairing from both platforms was automatic once the speakers were switched on, where a laptop was marginally even less idiot proof. Here I had to select Aurender in the list of output devices within the system preferences box on a Mac. Things were less smooth when using Audirvana for music replay; the first track played came out at ear bursting level despite the volume being set at a medium position. Luckily you can press pause with your elbow when your fingers are in your ears! Starting with volume at minimum was far less painful but it’s odd that you can turn it up well past 11 without the level getting excessive once everything has settled down. A remote handset is supplied with which you can adjust volume, but given the importance of the task under the circumstances, it’s somewhat vestigial. Because the S5W is a small speaker, I initially set it up quite close to the wall and after having plugged the appropriate dongle into my Moto G5 Android phone I gave the Aurenders a spin. It didn’t take long for me to realise the rear ports needed a bit more space; 40cm seemed to give a good balance of openness and bass extension in my room. I say bass extension but with a box that’s less than 22cm high and with what must be a 75mm bass cone this is a relative state of affairs; you can buy sound bars with built in ‘subwoofers’ that are smaller but they don’t produce bass as such. The S5W will produce a thump but it’s not doing much below 50Hz, I doubt any speaker of this size would. That doesn’t stop it delivering quite compelling imaging, partly because small boxes have less cabinet area to vibrate and thus they don’t seem to muddy the sound so much. This set up made relaxed but not exactly revealing sounds and got a bit ragged when the level was pushed. This smoothed off with warm up but the speaker is clearly superior to that particular source. On the Macbook Air things got more interesting, as the transparency level jumped up significantly and the dynamics went with it, I even tried Led Zeppelin’s ‘Immigrant Song’ [Led Zeppelin III, Swansong] and enjoyed the propulsion if not the full power of the piece. 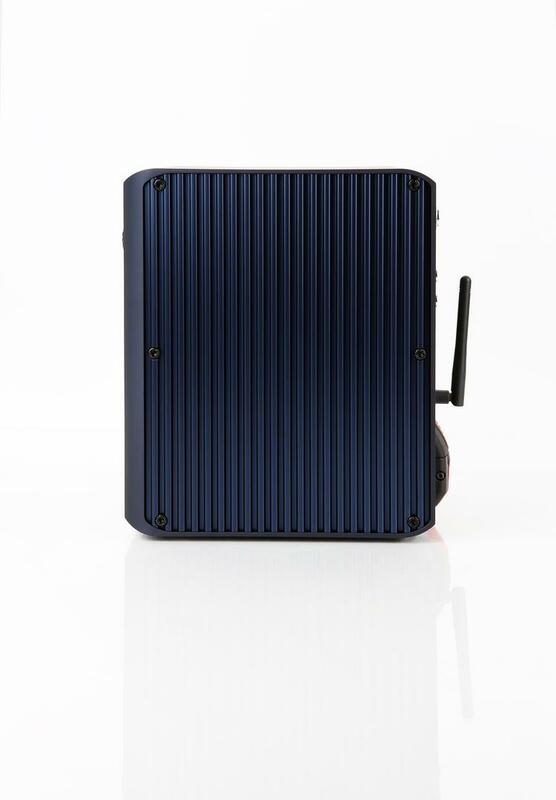 The Aurender is pretty good for such a small box; the active operation and the advantages of clean battery power means that it is inherently very capable and the wireless aspect doesn’t seem to undermine that at all. Muddy Waters’ powerful voice on ‘My Home is in the Delta’ [Folk Singer, Chess] loses some of its dynamics but remains strong, the spaciousness of the studio being obvious at the same time. I tested the bass by putting on James Blake’s ‘Limit To Your Love’ [JamesBlake, R&S] with its loud drum machine, and here the higher notes came through albeit without their room shaking power, though the lower ones were very quiet. The Aurender has not been tweaked to give excessive bass for its size, which is a good thing, but you can adjust tone with two buttons on the back should that appeal. I also tried some orchestral material using Beethoven’s 7th Symphony [Barenboim, Beethoven For All, Decca]. This worked surprisingly well, the speakers throwing up good image scale and delivering enough of the dynamic impact to make the piece compelling. You need to be a little bit sensible with the volume (the tympani made this clear), but this is in a larger than average, well-damped room. I suspect that smaller spaces would be easier to energise. Simpler material such as Doug MacLeod’s ‘Too Many Misses’ Exactly Like This[Reference Recordings] worked a treat. Yhe quality of the recording was obvious and that seemed to enhance the sense of dynamics that this speaker can produce.